To prevent damage to the wiper blades, do not use petrol, paraffi n, paint thinner, or other solvents on or near them. If the windscreen above the rain sensor is touched. If the windscreen above the rain sensor is wiped with a cloth. If the windscreen is struck with a hand or other object. Be careful not to pinch hands or fi ngers as it may cause injury, or damage the wipers. When washing or servicing the vehicle, make sure the wiper lever is in the OFF position. Contamination of either the windscreen or the blades with foreign matter can reduce wiper effectiveness. Common sources are insects, tree sap, and hot wax treatments used by some commercial car washes. To prevent damage to the wiper arms and other components, do not try to sweep the wiper arm by hand. To prevent damage to the wiper arm blades when raising both the driver and passenger side wiper arms, raise the driver side wiper arm fi rst. Conversely, when setting down the wiper arms, set the passenger side wiper arm down fi rst. Open the clip and slide the blade assembly in the direction of the arrow. To prevent damage to the windscreen let the wiper arm down easily, do not let it slap down on the windscreen. Do not bend or discard the stiffeners. You need to use them again. If the metal stiffeners are switched, the blade's wiping effi ciency could be reduced. So do not use the driver's side metal stiffeners on the passenger's side, or vice versa. Be sure to reinstall the metal stiffeners in the new blade rubber so that the curve is the same as it was in the old blade rubber. 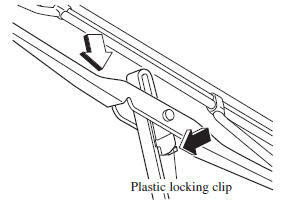 Raise the wiper arm and turn the blade assembly to expose the plastic locking clip. Compress the clip and slide the assembly downward; then lift it off the arm. To prevent damage to the windscreen let the wiper arm down easily, don't let it slap down on the windscreen. Hold the end of the rubber and pull until the tabs are free of the metal support. So don't use the driver's side metal stiffeners on the passenger's side, or vice versa. Install the blade so that the tabs are toward the bottom of the wiper arm. When the wiper no longer cleans well, the blade is probably worn or cracked. To prevent damage to the wiper arm and other components, do not move the wiper by hand. Raise the wiper arm and rotate the wiper blade to the right until it unlocks, then remove the blade. To prevent damage to the rear window, do not let the wiper arm fall on it. Pull down the blade rubber and slide it out of the blade holder. Remove the metal stiffeners from the blade rubber and install them in the new blade.